Fastening tourniquets onto bleeding patients in a timely manner can help save life and limb, doctors say. A room full of NISD school nurses learns about stopping bleeding. The American College of Surgeons has embarked on a nationwide educational campaign called Stop the Bleed. With serious injuries that involve bleeding, the wounded can die in a matter of minutes. Lessons learned in trauma hospitals and military conflicts have convinced many in the medical community that we all need to be trained to use tourniquets, just like everyone is encouraged to know CPR. You see automated external defibrillators (AEDs) in all sorts of public places these days: shopping malls, gyms, churches. The idea is to encourage people to jump in and help save someone having a heart attack. But do most people know how to help someone who’s bleeding? 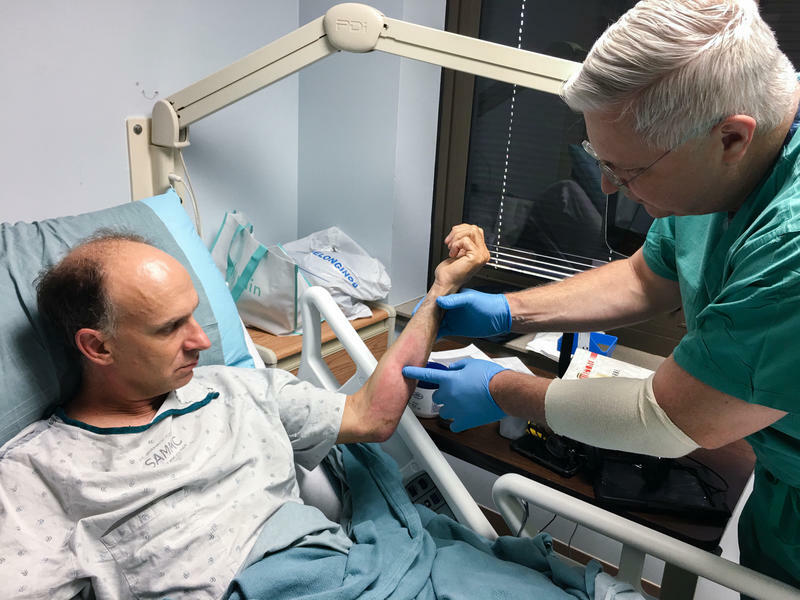 "There’s every reason to understand how to stop bleeding in a very timely manner," stated Byron Hepburn, MD, Director of the Military Health Institute at UT Health San Antonio. Proponents of tourniquet training for everyone say bleeding kits should be tacked up in public places next to automated external defibrillators. Hepburn believes the knowledge of how to stop bleeding is just as important and teachable as chest compressions for someone having a heart attack. "We started recognizing through the lessons learned from the last years of combat that we can save lives at point of injury through the use of tourniquets, compression devices and hemorrhage control devices," he said. Hepburn pointed out 15 years of experience with bloody war injuries in Iraq and Afghanistan have yielded proof of effective bleeding control techniques. The use of tourniquets had been largely abandoned until 2001 for fear it increased amputations. Packing a wound to stop bleeding requires filling it with gauze or another clean cloth. Faced with unprecedented numbers of people injured from explosions, the military researched and found out that tourniquets can be used safely without increasing the risk of losing a limb later. The American College of Surgeons and others promote the idea that tourniquets and bandages treated with a coagulation agent should be stowed in bleeding control kits next to those AEDs. That would be a transformational change, Hepburn said. "Once people are trained and understand this, they can do it safely, efficiently, and in a very timely manner," he added. Whether it’s injuries from hunting accidents or car crashes or violent attacks, stopping bleeding quickly not only saves lives, but also, cuts down on organ damage to the brain, kidneys and lungs, explains trauma surgery fellow Ashley McGinity, MD. Experts demonstrated tourniquet techniques at a recent class for Northside Independent School District nurses. "The longer those organs go without the proper amount of blood, the higher likelihood that there’s going to be permanent damage," she explained. "Obviously, decreasing the blood loss makes a big difference. Empowering people is exactly what our goal is." At a Northside Independent School District activity center, school nurses learn the best way to stanch bleeding using compression, bandages, and tourniquets in a class put on by University Health System. The tourniquets, in this case, are two inch strips of material covered in Velcro with a plastic tube that acts as a stick for tightening it down and keeping it in place. Donald Jenkins, MD, is a UT Health trauma surgeon who said if you pack a wound with gauze, it requires filling the wound entirely until the bleeding stops. "All we do is open that gap just a little bit and literally put this in like putting stuffing in a turkey," Jenkins remarked. One of the school nurses learning the techniques is John Marshall High School’s Deborah Rakestraw, RN. Military medical personnel say a tourniquet placed on a bleeding arm or leg, even for several hours, does not increase the risk of amputation. "We see a lot of things," Rakestraw commented. She says firefighters, police officer, educators, all need to expect the unexpected, even serious bleeding. "Those are things that you never assume that’s not going to happen at your campus," Rakestraw said. "If it can happen, it probably will. It’s just a matter of when and where." As part of a national Stop the Bleed campaign, one goal is to make bleeding kits as much a part of the public landscape as AEDs. The World Health Organization reports traumatic injuries kill five million people a year. Bleeding is the leading cause of death in trauma. Clean surgical instruments are a top priority at Brooke Army Medical Center after a backlog in sterilization prompted a slowdown in elective procedures. BAMC surgeons operate on more than 13-hundred people a month. Two weeks ago, however, some elective surgeries were postponed because of a lack of available sterilized tools for those operations. Skin cancer is extremely common, affecting more people than breast, colon and prostate cancers combined. The majority of skin cancers are easily treatable. Now, some dermatologists are using radiation instead of surgery to get rid of the threat. Your skin is your biggest organ. Many times, it’s also the most abused organ. The Zika virus continues to make headlines after it crept into the U.S., first in Florida and then here in Texas in the city of Brownsville. The mosquito-borne virus can cause devastating birth defects. Now the March of Dimes is making a big push to educate people as the spring mosquito season approaches. Texas Public Radio's Bioscience-Medicine reporter, Wendy Rigby, talked to San Antonio pediatrician Dr. Lawrence O’Brien. Here is a transcript of the interview. The burn unit at the U.S. Army Institute of Surgical Research in San Antonio, Texas, is hot. Sometimes, it gets up to 102 degrees in there, among the patients. People with severe burns can't regulate their own body temperatures well, so the air has to keep them warm. "We see a lot of gruesome stuff," says physical therapist Melissa Boddington. At the height of the fighting in Iraq and Afghanistan, more than 1,000 wounded service members were flown to the hospital.